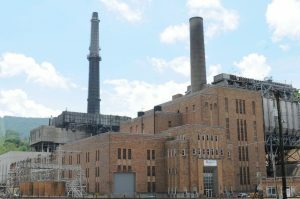 The advisory panel that will develop a carbon reduction program for Virginia power plants held its first meeting last week. The panel is tasked with developing a draft regulation that would cap greenhouse gas emissions from Virginia’s fossil fuel generating facilities for the first time ever. The advisory panel, appointed by Governor McAuliffe, includes environmental advocates, utility representatives, and renewable energy developers. Preston Bryant, who served as Virginia’s Secretary of Natural Resources under Governor Tim Kaine, will serve as a moderator. 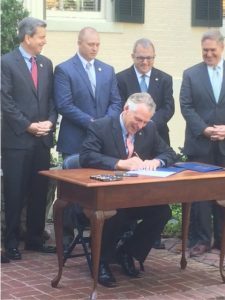 The panel’s work was set in motion in May, when Virginia Governor Terry McAuliffe issued an executive action directing the Virginia Department of Environmental Quality (“DEQ”) to draft a regulation restricting the emission of carbon dioxide from electric generating facilities. Executive Directive 11 ordered DEQ to draft a regulation pursuant to Va. Code §§ 10.1-1300, et seq. that will “abate, control, or limit carbon dioxide emissions from electric power facilities.” The directive states that DEQ must propose a regulation that is “trading ready” and will allow for the exchange of carbon emissions allowances with other states. The panel’s first job will be to determine how to structure a program where carbon credits or allowances can be traded among emitters. One option for a “trading ready” program would be for Virginia to join the existing Regional Greenhouse Gas Initiative (“RGGI”). RGGI is a regional carbon “cap and trade” program with nine northeast member states. Under RGGI, carbon allowances can be bought and sold at auctions, and the auction revenues can result in income for member states. However, the Virginia General Assembly would likely have to approve Virginia’s participation in RGGI. 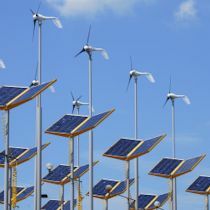 The General Assembly would also likely have to approve any carbon allowance trading program that results in revenues for the Commonwealth, as State agencies are generally prohibited from enacting revenue raising programs without legislative approval. The Governor’s directive was issued at the same time that the federal Clean Power Plan, a greenhouse gas regulation promulgated by the EPA during the Obama administration, is under legal challenge and subject to a stay by the U.S. Supreme Court. The Trump administration has also indicated that it will attempt to suspend or repeal the Clean Power Plan. Under the Governor’s executive directive, the advisory panel has until December 31, 2017, to present the proposed regulation to the Virginia State Air Pollution Control Board, which would then open up the proposed rule for public comment. Please contact one of our renewable energy lawyers or regulatory attorneys should you have questions about this matter. On May 16, 2017, Virginia Governor Terry McAuliffe issued an executive action directing the Virginia Department of Environmental Quality (“DEQ”) to draft a regulation restricting the emission of carbon dioxide from electric generating facilities. Executive Directive 11 orders DEQ to draft a regulation pursuant to Va. Code §§ 10.1-1300, et seq. that will “abate, control, or limit carbon dioxide emissions from electric power facilities.” The directive states that DEQ must propose a regulation that is “trading ready” and will allow for the exchange of carbon emissions allowances with other states. This type of action would be a first in Virginia. 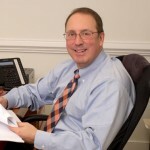 While the state Air Pollution Control Board has previously enforced greenhouse gas rules promulgated under the federal law – including the Clean Air Act’s new source permitting provisions – the Commonwealth has never before attempted to promulgate carbon rules based solely on state law. The Governor’s directive comes as the federal Clean Power Plan, a greenhouse gas regulation promulgated by the EPA during the Obama administration, is under legal challenge and subject to a stay by the U.S. Supreme Court. The Trump administration has also indicated that it will attempt to suspend or repeal the Clean Power Plan. The Governor directed that the draft regulation should be presented to the State Air Pollution Control Board for consideration no later than December 31, 2017. After the regulation is proposed, it will be subject the notice and comment procedures established by Virginia’s Administrative Process Act. Executive Directive 11 followed a report and recommendation issued by a workgroup chaired by the Secretary of Natural Resources. Please contact one of our renewable energy lawyers or regulatory attorneys should you have questions about this matter. On March 17, 2017, the Virginia State Corporation Commission (“Commission”) entered a final order on a rate increase application filed last year by Columbia Gas of Virginia (“Columbia”). The Commission approved a comprehensive settlement (“Stipulation”) agreed to by Columbia, the Commission Staff, the Attorney General’ Office, and several intervening parties. We are very pleased that our firm was able to help negotiate a favorable settlement on behalf of a group of retail gas suppliers. The Stipulation approved by the Commission will reduce the fees associated with competitive gas service in Virginia and provide more operational flexibility for suppliers in several key areas. In addition to requesting an increase to its revenue requirement, Columbia also requested several changes to its terms and conditions that would have adversely impacted both customers and suppliers in the competitive gas market. Our firm represented a group of competitive suppliers who provide gas transportation service to commercial customers in Columbia’s service territory. Among other issues, our clients were concerned that Columbia’s proposed changes to its terms and conditions would increase fees for gas transportation service and reduce suppliers’ ability to provide cost-effective service to customers. The Stipulation, however, resulted in several favorable tariff modifications, including reduced fees for daily gas transfer service and more reasonable penalties in the event suppliers over- or under-deliver natural gas on certain days. The Stipulation approved by the Commission also authorized a total revenue requirement increase of $28.5 million and established a rate of return on common equity (“ROE”) of 9.5%. Columbia had originally requested a total revenue requirement increase of $37 million and an authorized ROE of 11.25%. 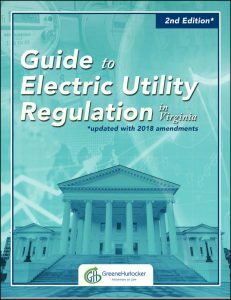 Please contact one of our regulatory attorneys for more information about this case, or should you have any questions about competitive energy markets in Virginia and the Mid-Atlantic.